In this Duracell-powered Episode 42. 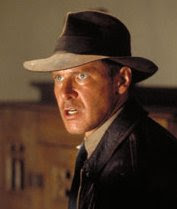 Major Indiana Jones IV news and fantastic Nicholas Cage shocker! Script-doctor Paul Haggis returns to Bond 22 and Chow Yun Fat wants more US lead roles. He-Man to return to the silver screen but Mark pulls the plug on The Colonel's Aliens vs. Predator 2 report. The Clone Wars returns and we reveal the next of Frank Miller’s works to be filmed. In the world of tech: Why not order and pay for your food via Microsoft's new interactive dining table. Oh yeah, we also give our final verdict on Heroes and talk about Pirates. It and much more is all here.